Odisha is one of the States of India. It is located between the parallels of 17027'N and 22034'N latitudes and meridians of 81027'E and 87029'E longitudes. It is bounded by the Bay of Bengal on the east; West Bengal and Jharkhand on the north; Chattisgarh on the west and Andhra Pradesh on the south. It has a coast line of about 480 kms. It extends over an area of 155,707 square kms accounting about 4.74% of the total area of India. According to the 2001 census, it has a total population of 36,706,920 (3.57 percent of the total population of India), out of which about 18,612,340 are male and 18,094,580 are female. Administratively, it has 30 districts, 3 Revenue Divisions, 58 Sub-Divisions, 51,061 villages and 127 Urban Centres. On the basis of homogeneity, continuity and physiographical characteristics, Odisha has been divided into five major morphological regions : the Odisha Coastal Plain in the east, the Middle Mountainous and Highlands Region, the Central plateaus, the western rolling upholds and the major flood plains. The Odisha Coastal Plains are the depositional landforms of recent origin and geologically belong to the Post-Tertiary Period. The 75 metre contourline delimits their western boundary and differentiates them from the Middle Mountainous Region. 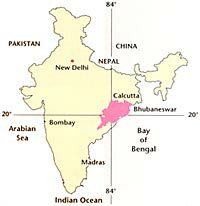 This region stretches from the West Bengal border, i.e. from the River Subarnarekha in the north to the River Rushikulya in the south. This region is the combination of several deltas of varied sizes and shapes formed by the major rivers of Odisha, such as the Subarnarekha, the Budhabalanga, the Baitarani, the Brahmani, the Mahanadi, and the Rushikulya. Therefore, the coastal plain of Odisha is called the "Hexadeltaic region" or the "Gift of Six Rivers". It stretches along the coast of the Bay of Bengal having the maximum width in the Middle Coastal Plain (the Mahanadi Delta), narrow in the Northern Coastal Plain (Balasore Plain) and narrowest in the Southern Coastal Plain (Ganjam Plain). The North Coastal Plain comprises the deltas of the Subarnarekha and the Budhabalanga rivers and bears evidences of marine transgressions. The Middle Coastal Plain comprises the compound deltas of the Baitarani, Brahmani and Mahanadi rivers and bears evidences of past 'back bays' and present lakes. The South Coastal Plain comprises the laccustrine plain of Chilika lake and the smaller delta of the Rushikulya River. The Middle Coastal Plain forms a "Pan plane". The process of delta formation is quite active here and very fast along the northern part of the coast, covering the Balasore Plain. The whole region is made up of older and recent alluvium. This region has also well-defined morphological units parallel to the shoreline with relation to its configuration (a) the salt tract along the coast, (b) the arable tract on the middle and (c) the submontane tract on the western foothills of the Eastern Ghats. This region has a remarkably straight shoreline with well-defined beaches of sand and shingles. Here the beach ridges indicate the emergence of the coast. There are also several sand bars and sand dune ridges parallel to the coastline with the height between 16 to 27 metres and length between 1 to 4 kms. These have originated owing to the recent coastal uplift. Three types of shorelines have developed along the coast : (a) the rocky shoreline between the deltas. (b) the sandy shoreline, and (c) the alluvial and silty deltaic shoreline. The spurs of the Eastern Ghats entered into this plain at some places forming several small hillocks on the plains and islands in the Bay of Bengal and inside the Chilika Lake. This region covers about three-fourth of the entire State. Geographically, it is a part of the Indian Peninsula which was a part of the ancient landmass of the Gondwanaland. The major rivers of Odisha with their tributaries have cut deep and narrow valleys. This region mostly comprises the hills and mountains of the Eastern Ghats which rise abruptly and steeply in the east and slope gently to a dissected plateau in the west running from north-east (Mayurbhanj) to north-west (Malkangiri). This region is well marked by a number of interfluves or watersheds. The Eastern Ghats is interrupted by a number of broad and narrow river valleys and flood plains. The average height of this region is about 900 metres above the mean sea level. The Subarnarekha-Budhabalanga-Baitarani interfluve comprises the major mountain ranges like the Similipal (915 metres) and the Meghasan (1165 metres). The Baitarani-Brahmani interfluve comprises mountain ranges like Badampahar (1,075 metres), Kunaratir (1,064 metres), Malayagiri (1277 metres) and other mountains of Keonjhar, Palalahara and Dhenkanal. The Brahmani-Mahanadi interfluve comprises the discontinuous mountains of low heights stretching from Sambalpur to Cuttack such as : Nrusinghanath (986 metres), Panchdhar (915 metres), Tikarapara (901 metres) , Bonai hill (769 metres), Bamra hill (761 metres), Kapilas hill (636 metres) etc. The Mahanadi-Rushikulya-Vansadhara interfluve comprises the mountain ranges of Nayagarh, Khandapara, Khondhmals, Phulbani and Ganjam. The important mountains are : Mahendragiri (1525 metres), Singra See hill (1313 metres), etc. The Nagavali-Sabari-Tel interfluve comprises the Chandragiri-Pottangi mountains with Deomali (1672 metres), the tallest peak of Odisha. The other peaks are - Sinkaram (1620 metres), Golikoda (1617 metres), Yendrika (1582 metres) etc. The plateaus are mostly eroded plateaus forming the western slopes of the Eastern Ghats with elevation varying from 305-610 metres. There are two broad plateaus in Odisha : (i) the Panposh-Keonjhar-Pallahara plateau comprises the Upper Baitarani catchment basin and (ii) the Nabrangpur-Jeypore plateau comprises the Sabari basin. These are lower in elevation than the plateaus having heights varying from 153 metres to 305 metres. The Rairangpur rolling upland, a part of the Subarnarekha basin, comprises the northern part of the Mayurbhanj district and slopes towards the north. The Keonjhar rolling upland, a part of the Baitarani Basin, lies at the fringe of the Keonjhar Plateau. The Rourkela rolling upland lies on the Upper Brahmani basin. The Bolangir-Bargarh-Rairkhol rolling upland lies on the Ib-Jira-Jhaun-Suk-Tel-Tel basin (the Upper Mahanadi basin). The Aska rolling upland lies on the Upper Rushikulya basin. The Rayagada rolling upland lies on the Vansadhara and the Nagavali basins. The Malkangiri rolling upland lies on the Sabari-Machhkund basins of the Dandakaranya Region located on the southern tip of Odisha.